Oy, how many times have I found my mind wandering when talking to someone I care about something pretty important! In fact, I’ll be honest. It happened just the other day. Tim and I were having a conversation about a sensitive subject, and my mind wandered to something so frivolous that I caught myself having “missed” at least a couple of minutes of what he was saying. Now of course, we could look at “why” my mind wandered – and how what he was sharing was to “confronting” to me (even unconsciously) for me to stay present with him to hear it – but that’s not the point I’m writing about today. And the truth is, my mind can wander when we’re talking about stuff that is rather benign too. He might just be telling me about his day and there I am, thinking about when I’m going to get over to Costco! Now this does not an effective relationship make. As it turns out, actively listening – truly listening and giving another person 100% presence with you – is one of the biggest gifts we can give someone and the true foundation of intimacy. 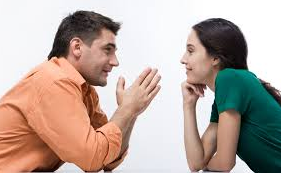 Did you know that there are studies out that just listening to someone – just holding a space for their experience – has been proven to reduce their blood pressure, decrease their heart rate, and support their own problem solving without you saying anything?!? And let’s talk about problem-solving too when someone else is sharing with us. Does anyone else immediately jump in their heads to some helpful solutions you could impart to the other person? (Guilty as charged!). Most of the time this ain’t what the other person wants to hear – at least not until they’re done being fully expressed. (And even then, often someone A) isn’t “ready” for the problem-solving stage yet, or B) doesn’t even want problem-solving and didn’t ask for it!). Yes, I know that we problem solvers are only trying to help. But it makes the other person feel unheard and unseen, like we’re trying to rush to “what they should do” rather than just holding a loving container for their self-expression. So what to do? Proactively CHOOSE to really, really listen. Sit down for a conversation, keep your breathing deep, and your mind focused. If you catch yourself wandering off, bring your attention right back, remembering the act of love it is to be fully present with this person. If solutions come up, hold them. If you notice yourself preparing a rebuttal, again bring your focus back to listening (there will be time for you to speak your peace or offer your ideas later). You just might find that it’s pretty gratifying to share such a space of in-the-moment connection with another beautiful human being.